Our "Virtual Sunday Church" gives us a famous hymn, rarely heard today, as the anthem in the Church of St. Gertrude. Heavenly Father, let me live this day as the gift it is, for You has truly blessed me to live it. And if I may suffer, I will carry with me the certainty that one day I will see You face to face, a day when all things will become clear and my pain will be made whole through the grace of Christ, my God. Blessed be you, oh Lord my God, and blessed be the day you have given me. Fresco in the ancient Holy Trinity Church, western Ukraine. Let no Christian parents fall into the delusion that Sunday School is intended to ease them of their personal duties. The first and most natural condition of things is for Christian parents to train up their own children in the nurture and admonition of the Lord. Jonah's prayer, in the form of a psalm, is laden with meaning and makes unmistakable metaphor of the entire incident. He directly compares the whale to Sheol, the Hebrew concept of hell. But oddly, he does not treat his own disobedience or sinfulness, nor speak directly of his odd circumstances. It is a general psalm, praising God for his mercy in saving a man from the punishment inflicted on him by the world. 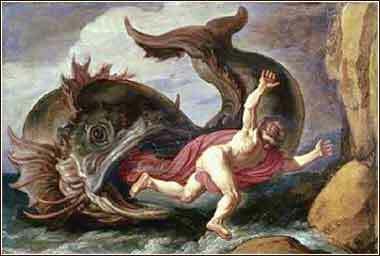 Jonah spends three days in the whale's belly, just as Jesus would spend three days in death before his resurrection. It is said that Christ descended into hell during that time, in order to offer salvation to all those who had died before His coming. So Jonah becomes, with this prayer, an important prophet of the Messiah, for his song is a statement of confidence and thanks that God will rescue those who have been condemned by the forces of earth. We do not have to stretch far, to say that the inescapable sinfulness of mankind is the product of being created to live on earth, or that sin comes from our mortal incarnation. And immediately after, we get the wonderful last line, "the Lord spoke to the fish, and it vomited Jonah out upon the dry land." He is saved from his destruction, as the faithful dead would one day be saved in the three days of Jesus' death.